Now the winter nights are drawing in what better way to keep warm than with our fantastic Cast Iron Effect fireplace. With natural looking wood effect logs, that light up, not only with you be warm and cosy in front of the TV, it will also look like you've gone to all that trouble of building a fire! Quality made, electrically operated with bulb light for flame effect, our Cast Iron Effect Fire is the perfect addition to your living room. This electrical fireplace ensures you a permanent comfortable heat and provides the complete aesthetics of a wood stove without the inconvenience. 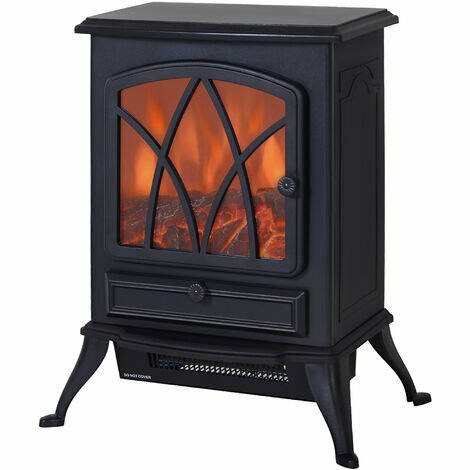 This traditionally styled electric stove with a black cast iron effect finish and a log frame effect. Its flame effect can be used independently of its two heat settings. The inner flame effect is generated by a bulb light and creates wood-like burning, realistic flame effect.